Though I am notoriously cheap, I love when i have a legit reason to buy stuff. Not just any old stuff - tires are a drag. So is Windex, flea treatment, and heating oil. What's not a drag: soaping supplies! Two of these are new to me - the Stormy Nights fragrance I have used once before. 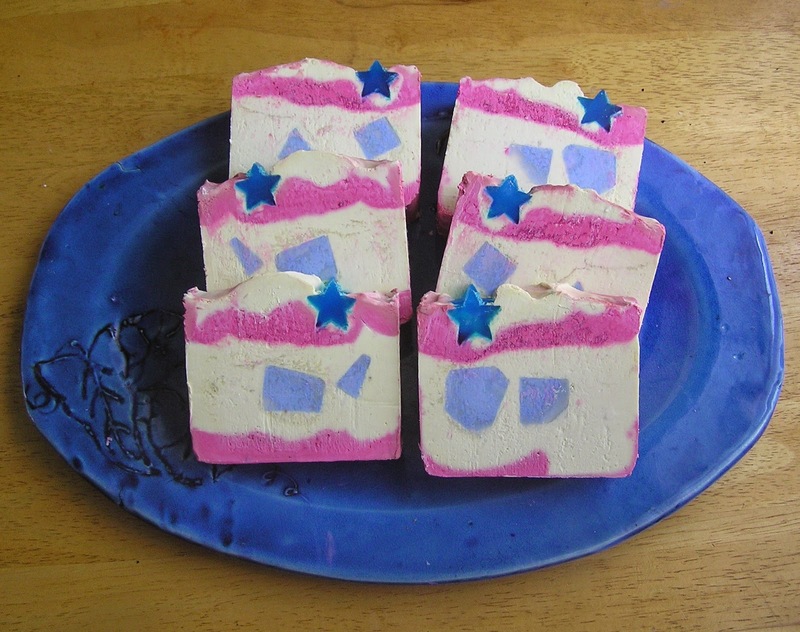 It was one of my favorite soaps ever, a clean ozone-y scent with a hint of violets. I used a purple colorant and a thin gold mica line. The other two just sounded like the kinds of fresh-fresh scents that I enjoy. Someday I may start buying essential oils and less-complex fragrances, so I can create my own scents. 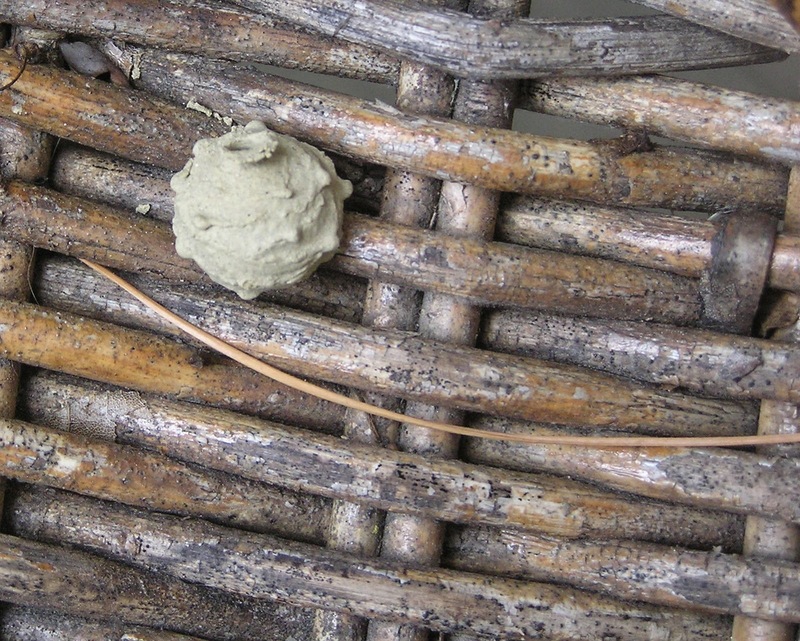 Right now I am more interested in the chemistry of saponification itself, and in making silky, moisturizing lather with big bubbles, and a hard, long-lasting bar of soap. Soap takes a while to cure, so it may be September before the batches made from these scents are available. Haven't forgotten clay! 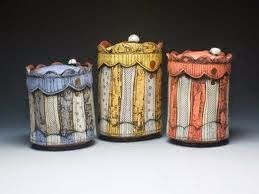 Working on butter dishes, cat urns, and plates right now. 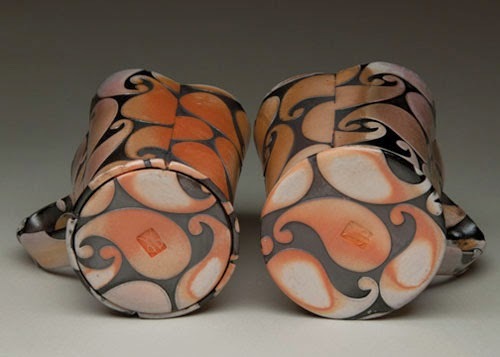 Next firing will probably be August 13th, unloading the 16th. See lots more of Jason's appealing work here. Seriously, you guys need to come to Date Night at Portland Pottery. 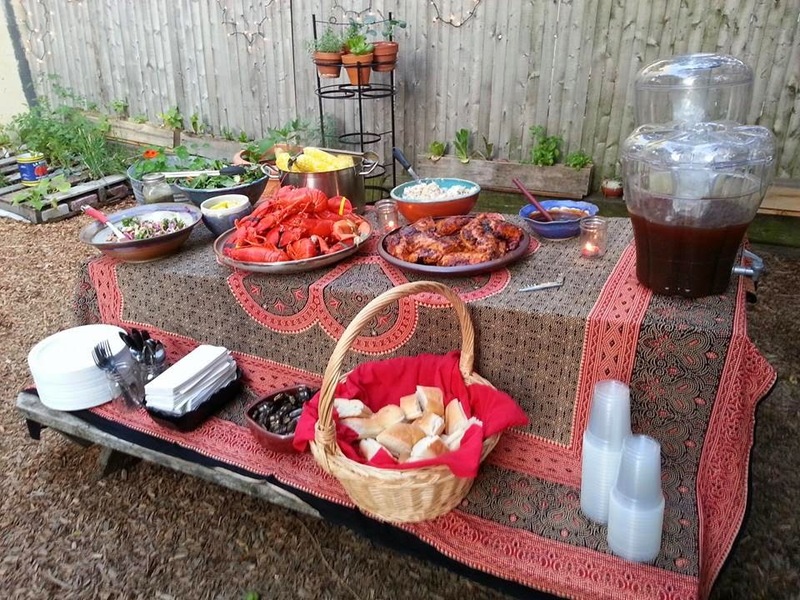 This was the spread Manda put on. Oh, and there was a raku firing, too. I was holding the tongs, so not in a good spot to photograph that! I'll keep you posted when the next one is happening. 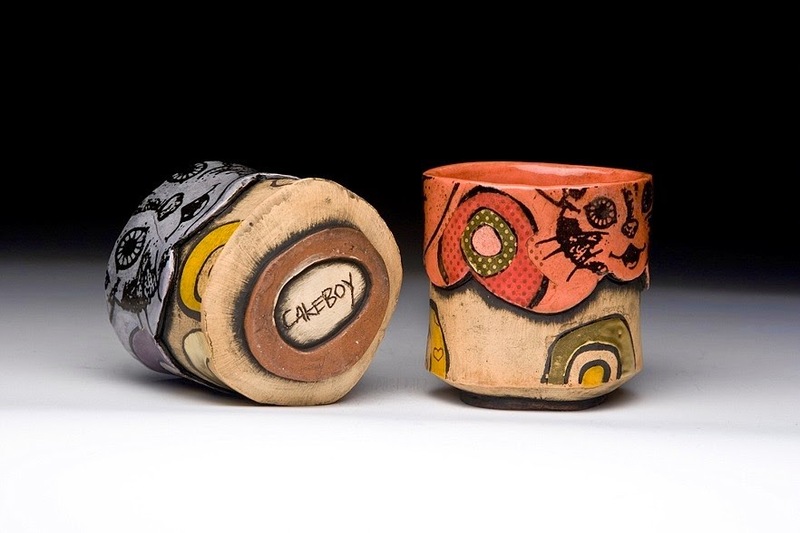 Every once in a while I read something about a technique to print a slip or underglaze design from a laser print. You know the one, where the toner behaves like a resist? Sorta looks impossible. Every once in a while I try to figure it out. This time I think I succeeded! Even though the tutorial is available from lots of people who are better at this than I am, I wanted to post it to mention the tricky spots, and what to do about them. 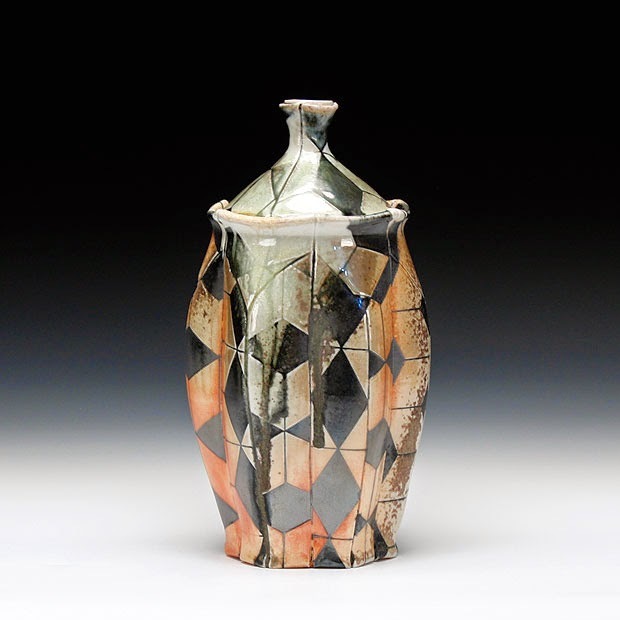 Slightly thin underglaze or slip. The thinner it is, the better it will roll away from the toner as, but also the fainter the design will be. This will take some monkeying around with, to get it right. A soft brush. Very soft. A stiffer brush seems to press the slip to the paper too hard. A spritz bottle of water. Very important! Release will be blotchy without it. 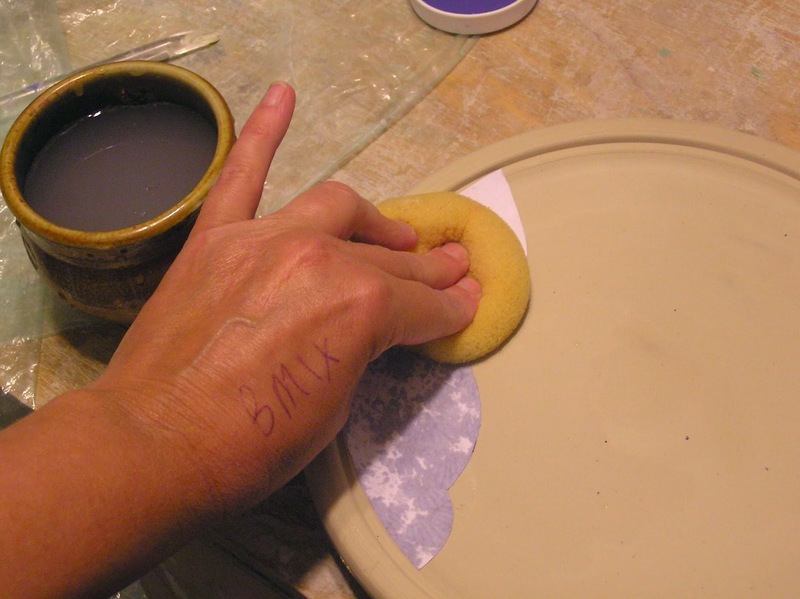 Brush your slip or underglaze onto the printed side of teh paper. 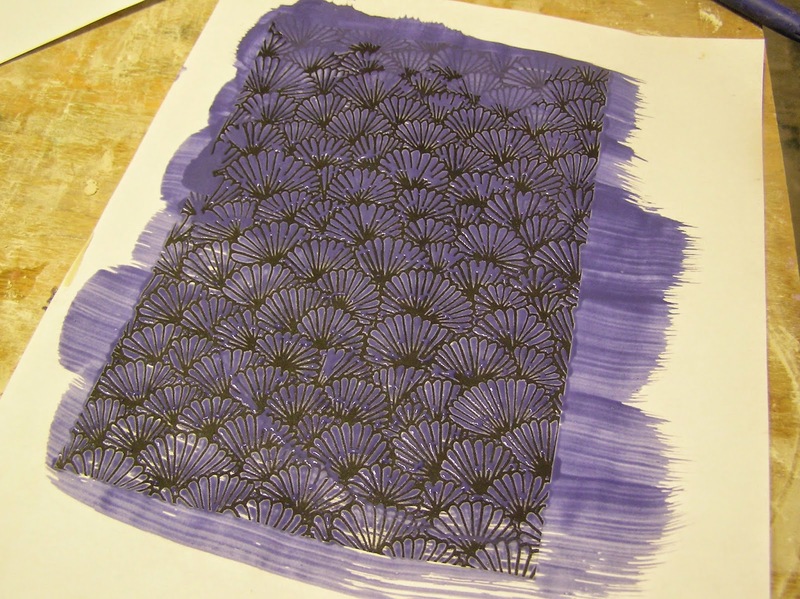 One coat only; once the paper is wet, the resist doesn't work as well. Watch the slip roll away from the black areas. If a few spots are recalcitrant, you can blow on them really hard to encourage the slip to move. If the resist doesn't happen, your slip may be too thick. Let the slip get bone-dry. 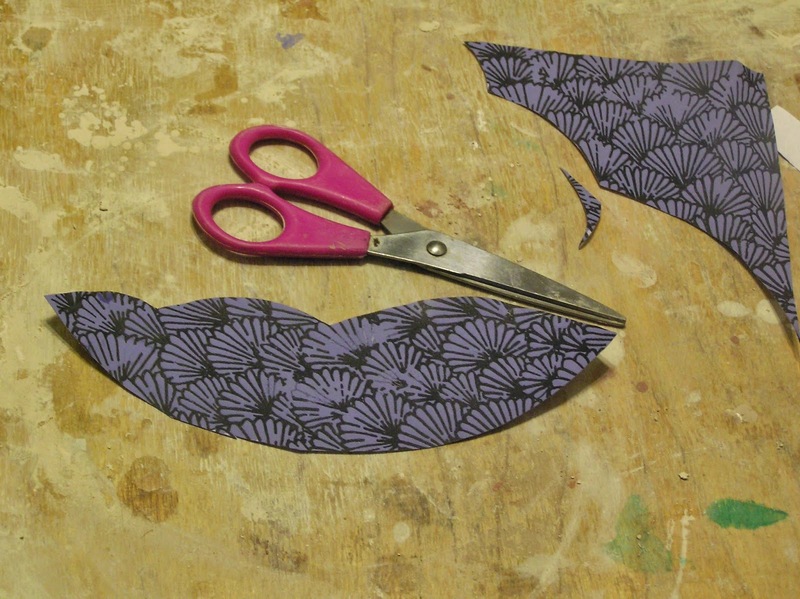 Cut into the shape of the print you want to make. Spritz the back of the paper. Press repeatedly with a wet sponge. You'll begin to see the image showing through the paper. If there are areas where the image doesn't show, press the we sponge in those spots until it does. 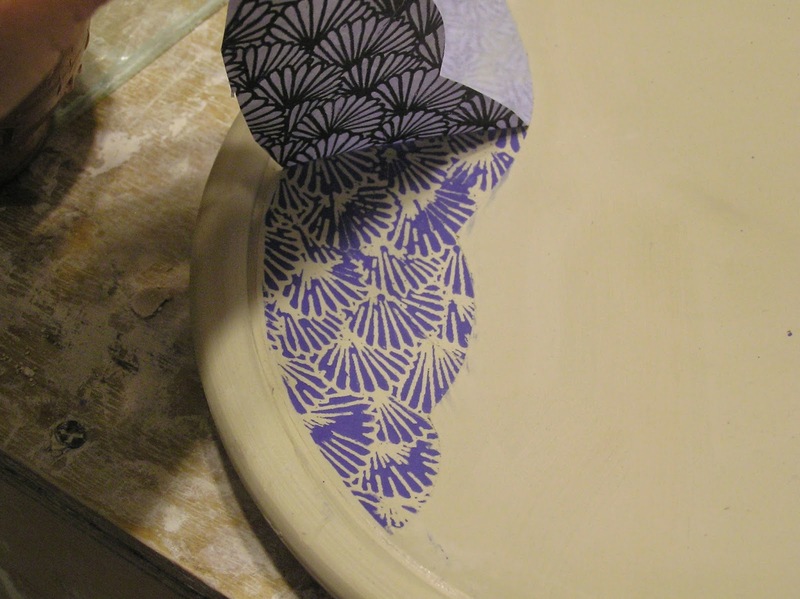 Using the rubber rib, smooth the paper to the clay to encourage the transfer. Peel up the paper. Voilet! or whatever. Image transferred. Mine is still a little blotchy - I'll clean it up with a sgraffito tool later. I think with some practice I can get a cleaner image. Photos below, for the visual learners (like me) among you. I just realized my hand reads "Bmix!" When I absolutely must remember something, I'll often write it on the back of my hand. I like to think it's not that I have a terrible memory, only that I have so much to remember. 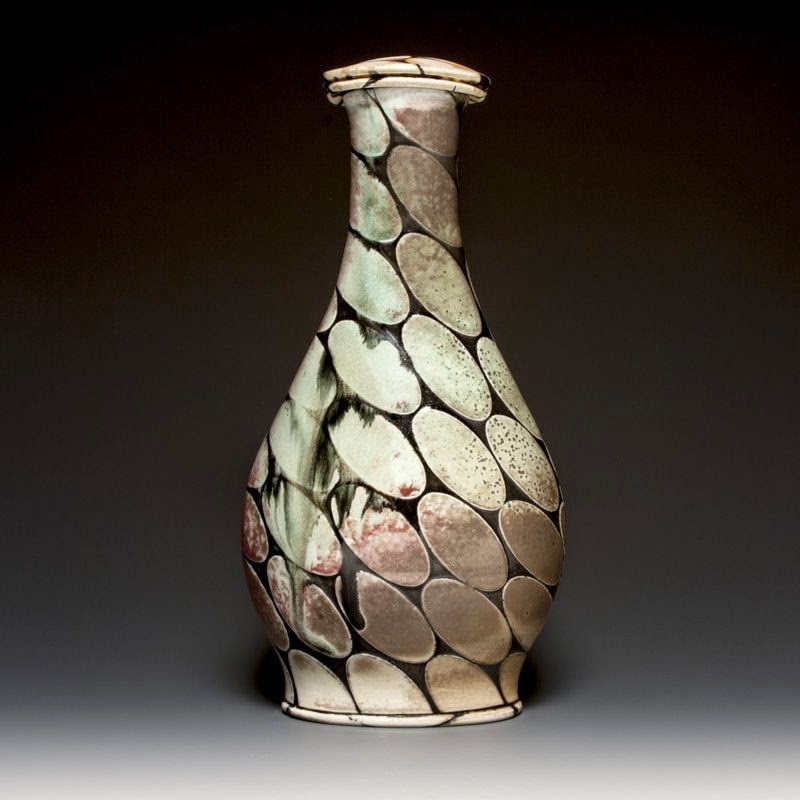 Tonight is Portland Pottery's Date Night raku firing, so lots to remember for that (starting with going there in the first place.) I'm out of bmix, so wanted to be sure and get some while I am in Portland anyway. LOL. Did you find this post valuable? Buy me a coffee! I am enamored of patterns, as you may know, and especially partially-decomposed patterns, in which the flame has a say in the final outcome. I also appreciate the work on the bottoms of the pots - I am always telling student that "use" includes not just serving and eating, but washing up and putting away. I think it's nice to add a little something for the person who does those things. If David has a website, I couldn't find it; but his work is available for sale at Schaller Gallery and at Crimson Laurel. 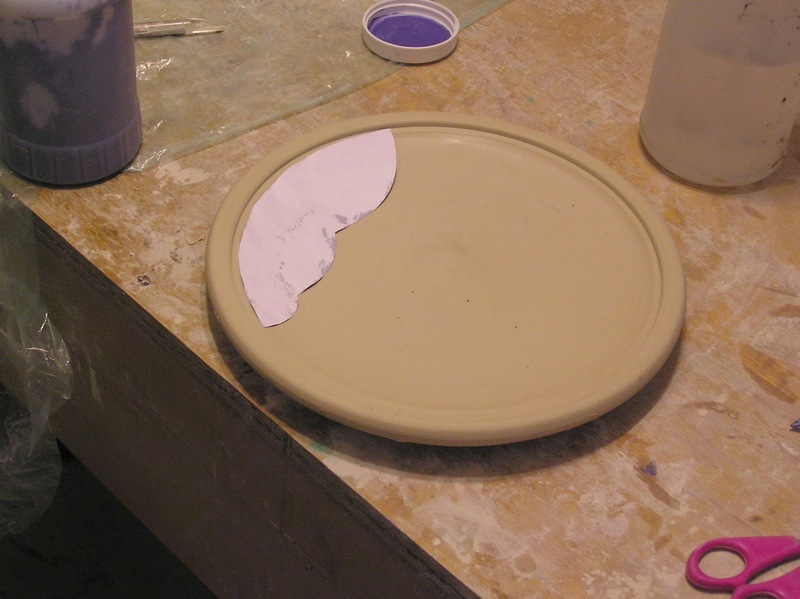 Many years ago, someone asked me why so many potters hate to make plates. I couldn't answer for all potters; it wasn't even easy to answer for myself, though at the time I did, in fact, hate to make plates. 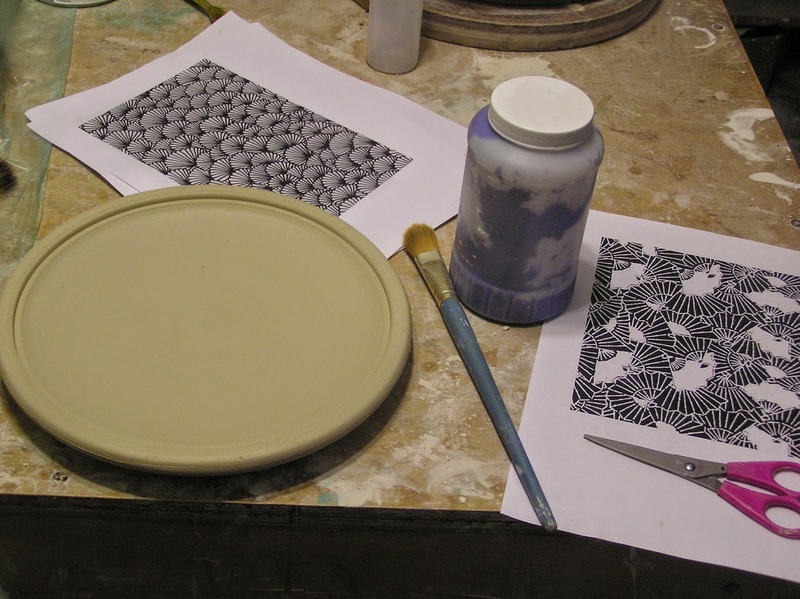 It wasn't the skill involved - it's hardly more difficult to make a plate than a bowl. They do have a pretty high breakage & loss rate, but it wasn't that either. Plates occupy a funny place in the world of functional ware. They are ubiquitous on western tables, but almost always in sets. Even the most casual of households tends to put matching plates on the table at mealtime. People think of mugs as individual. A mug with a cute saying or a picture of somewhere you've been, or indeed, a handmade mug can help define your identity to the world somewhat like your clothes or your car or even your sofa do. Nobody seems to have their special plate that speaks to who they are. Nobody buys one plate. It never was plates that I hated; I hate making sets of plates. People's eyes are so accustomed to the exact match of machine-made plates that the tiniest differences read as flaws. 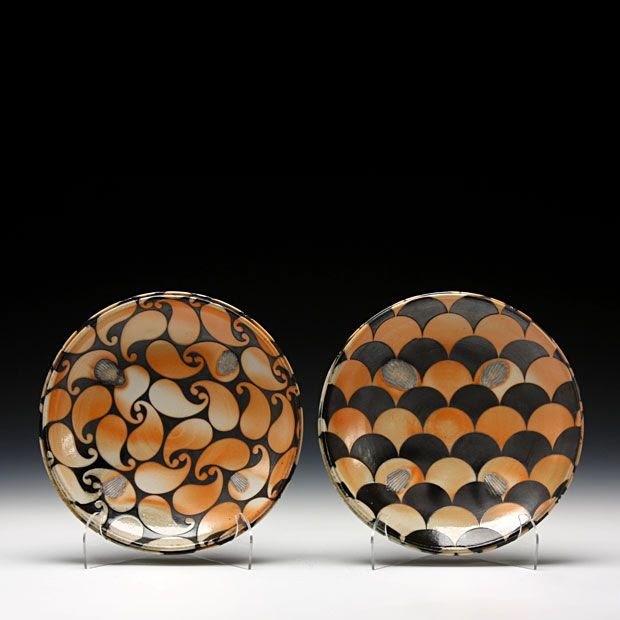 Once I accepted that I prefer making plates that are cousins rather than twins - a lesson driven home by the Great Plate Debacle of 2012 - I discovered that I actually love making plates. 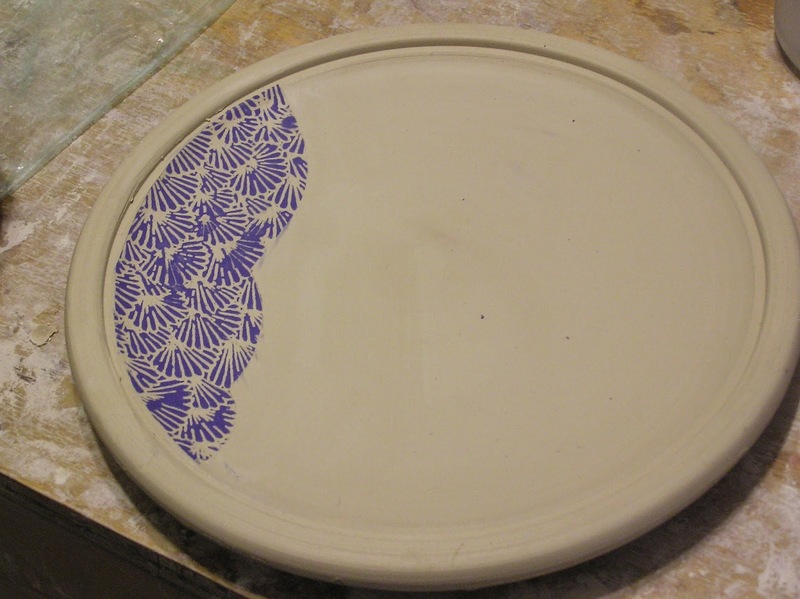 I don't think I blogged about the Great Plate Debacle at the time, I was so discouraged and annoyed. A couple from Colorado bought four plates of mine in a local store. They later called the proprietor to ask if they could order more. Despite my policy to never, never, never, never take custom orders, I took this one because the store owner is a good friend of mine, and, like all of them, it ended poorly. (Even the ones that end well end poorly, as I always put far more time into a custom order than I could ever hope to be paid for.) I made the plates, but the customer said the oribe was a little brighter on some than others, and there was an eighth-inch difference between the biggest and the smallest...ugh. Not clear on the "handmade variation" concept! Worst of all, now they didn't want ANY of the plates...even the ones they had purchased, in the store, six months previously, before they even placed the order. There's more to this stupid story, but even typing it is giving me a stabby feeling, so I'd better stop and go watch some cute-kitten videos. Whew! I'm back. Anyway, here in the present, I love making plates. 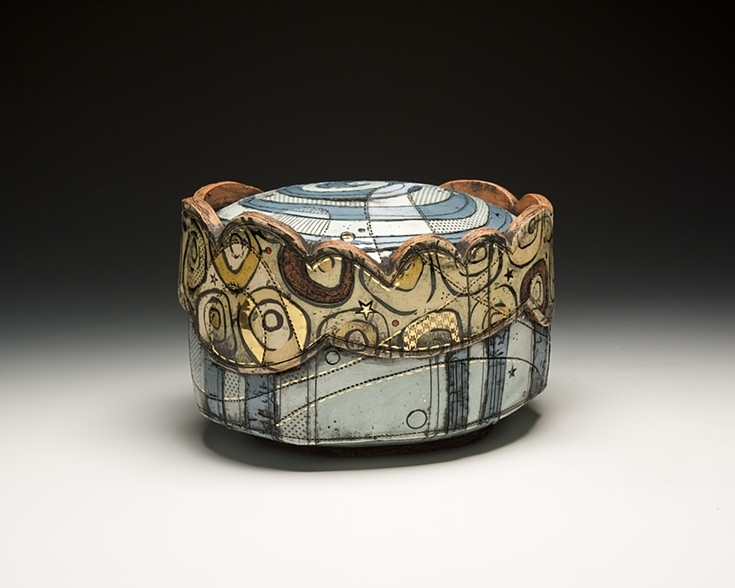 They are a wide canvas of space that cries out to be stamped, slip-trailed, and glaze-embedded. 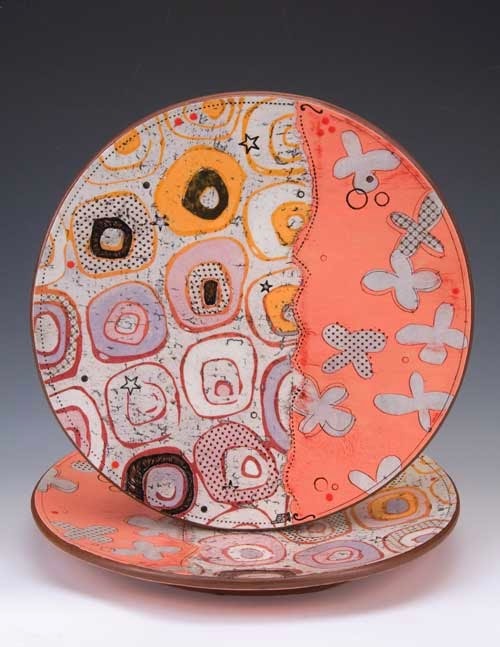 Even better, I need five plates for a group show in the fall, and they have to be fabulous. I'll probably make between 30 and 60 plates to get the Fabulous Five. Above are some in progress towards this goal. I had hoped to trim and decorate today but the humidity is not cooperating! Maybe today is housecleaning and lawn-mowing, and tomorrow, back to the plates. I got this recipe from Hope Rovelto, a sculptor and then-kitchen manager at the Watershed Center for Ceramic Arts. 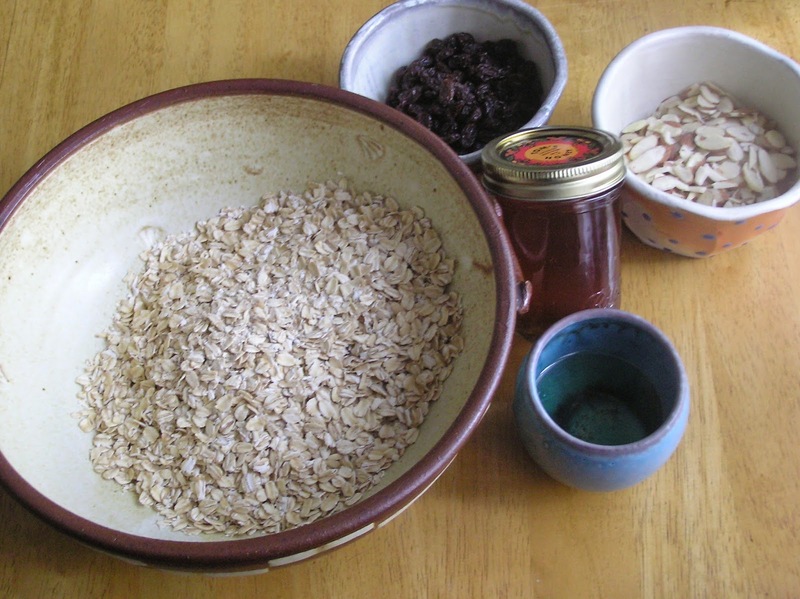 I did a work-week residency there years ago (I've done a couple, actually) and I was amazed at how much better Hope's granola tasted than any store-bought granola I'd ever had. Turns out to be super easy to make, also! Here's how it goes. Spread mixture onto baking sheet in 1" layer. Bake at 325º for 10 minutes; flip mixture with spatula, and bake 3-5 minutes more. Remove from oven and let cool enough to touch. Mix in raisins and almonds. Serve with milk, yogurt, or ricotta cheese and fruit. Speaking of Watershed! This Saturday is Salad Days, Watershed's annual fundraising blowout party. It's like a potter's reunion. They'll have a band, beautiful plates, and all the salad you can eat. Check it out here. That's what I sold at the Portland Farmer's Market today. All of which were to friends. I had to park my car more than a mile away to find a place to park. Fortunately I was able to find a nearby metered spot to unload my work, but you're only allowed to occupy the spot for two hours - that's true all over intown Portland. I feared parking in the nearby garage would cost more than I made - and I would almost have been right. So I dropped off my stuff, parked at distance and hiked back. The farmers - some of them - were, how-you-say, unfriendly. I was careful to stay outside the designated farmer's market area, and not to take too much space, but some clearly felt that artists were interlopers. Well, hell. Sold two buttons and two bars of soap. Would have liked to do more, but it beats a sharp stick in the eye. If I had to sit around outside all day, I couldn't have asked for a better one. Saw several friends out and about in Portland, a couple of whom came just to see me; the others were folks I used to work with, then drink with, back when I lived in Portland. who had her jewelry booth beside me. Cullen had sort of a slow day, too, but it seemed to get a little better toward the end. We chatted and kept each other amused during the slow parts (which is to say, all day) and Cullen was kind enough to drive me and my stuff back to my car. Came home with a jar of local honey, for my next batch of soap and for homemade granola, which beats the balls off of store bought. Recipe soon! So, by my count there were three things that sucked but five things that did not. Let's call that a success, shall we? Not that I'll be doing that particular event again! I may try the Saturday Farmer's Market, though; everyone* says it's a better event for artists. *by 'everyone" I mean the exactly three people with whom I have spoken about this event. All agree! Into my endless quest to patchwork an income together, I have sewn a new square. Some of you may know that I built my own website. I could have used Weebly or Wordpress or Wix, but honestly I think most of the template sites look like they were built from templates, which isn't the look I wanted, as a creative professional. I also didn't want an additional tag in the web address - .dot-wordpress or whatever - as it gives me a sense of the temporary or the dabbler. Turns out to be not that hard to build a website, and actually quite enjoyable work. It's a satisfying feeling when the page goes live for all the world to see. Took a while, but it finally dawned on me that this is what is known as a marketable skill! One that wouldn't require me to punch a clock or sit at desk for hours: in other words I skill that would allow me to continue to be self-employed. 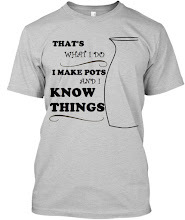 Have no fear; I'll still be a potter, and I'll still be a ceramic educator. This is just another patch in the quilt, another way to keep myself afloat. I won't say I'm unsinkable, but I haven't sunk yet. 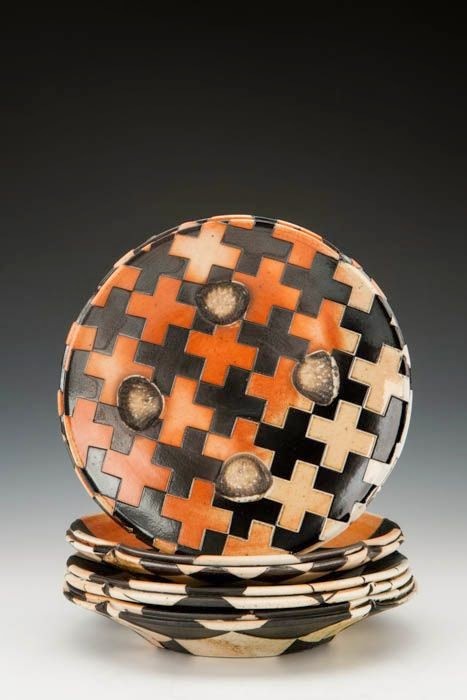 One could argue that functional pottery is art which is only completed when in use. Though I usually post more formal shots of ware - gradated background, etc. - somtimes it's nice to see it in its finished form. This little tulip-faceted dessert dish is a shape I keep coming back to: simple, pretty, such a useful bowl. In this case dessert is vanilla yogurt with strawberries and whipped cream. The cookies are wafer-thin pizzelles, snapped in half, as much for decoration as for sweetness. A cool treat for summer. If you make this dessert, my suggestion is to assemble it just before serving - the thin cookies get wet if they sit around stuck in the yogurt, and the berries weep. Still tastes as good, but doesn't look as fresh. This is a special-occasion dessert, but I use this bowl almost daily. My breakfast version of this is ricotta cheese and berries, minus the whipped cream and cookies. See lots more of Lucien's work here. Between scheduling conflicts, car troubles, unexpected guests, and migraine headaches, I've been trying to get to Portland's First Friday event for TWO YEARS without success. I haven't tried every single month, of course; I have no desire to stand on a sleety Portland sidewalk in March waiting for people to not buy stuff because they just want to get inside. But July? And July 4th, no less? Bring it on! I had - I have - my ducks in a row. My pots are all priced and packed, I've got bags, change, and a calculator, and a small table for display. The table I borrowed from my mother - Portland is pretty generous about street vendors but they do require they you take up no more than 12 square feet, including your chair. But now the forecast says steady rain, the remnants of Hurricane Arthur. I could go anyway and hope for the best. I did make a decision that I am going to have to push all fronts harder to sell stuff. But Portland is an hour away, and the whole deal would eat up most of day with little hope of good sales. Not to mention standing out in the steady rain, hating life. Yeahno. Skipping it. However! Next week is looking pretty good - cloudy and warm, not sweltering - so maybe I'll show up Wednesday for Farmer's Market. I'm in town on Wednesday anyway.